There are those defining moments in every person’s life. The moments we cherish, like the birth of a child. The moments we grieve, like the loss of a loved one. And the moments that serve as our bookends. For many of us, those moments are marked by the music we encountered and loved and drew into our hearts and our lives. Music, for The Legal Genealogist, like the music of Paul Simon and Art Garfunkel. It’s the music I grew up with. The music that spoke to me in so many ways. Music to rejoice with in times of joy (“I got no deeds to do, No promises to keep, I’m dappled and drowsy and ready to sleep, Let the morning time drop all its petals on me”). Music to comfort in times of grief (“When you’re weary, feeling small, When tears are in your eyes, I will dry them all”). Music to share (“I am a citizen of the planet”). Music to plumb the depths of aloneness (“Hello darkness, my old friend, I’ve come to talk with you again”). Music to tell the stories of the day (“He was my brother, Twenty-three years old the day he died”). Music to express our fears (‘Now the sun has disappeared, All is darkness, anger, pain and fear’). Music to express our hopes (“Last night I had the strangest dream, I ever dreamed before”). 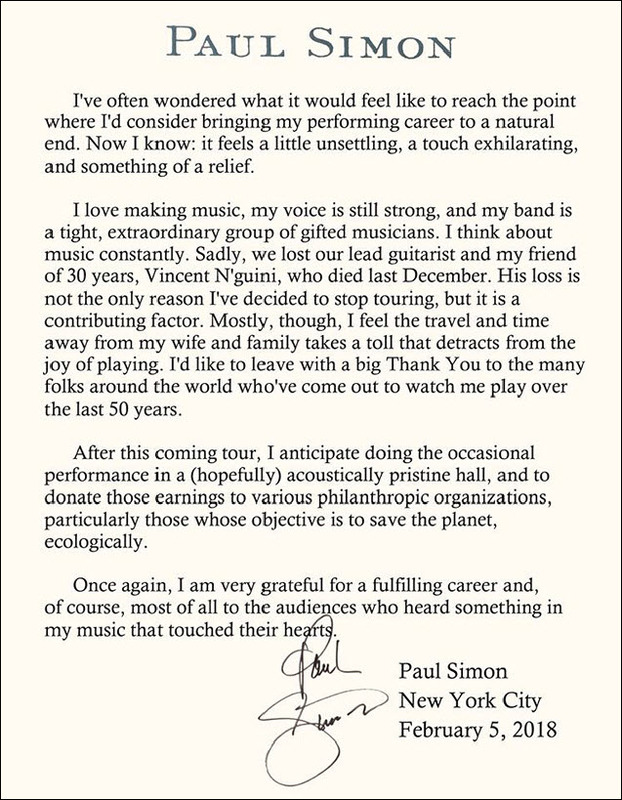 But now Paul Simon has announced that his musical touring career is coming to an end. There’s just going to be one final tour, starting May 16 in Vancouver and ending June 20 in Nashville, followed by one last European tour and then, perhaps, an occasional appearance. So, now, it’s time to speak to the maker of the music… and simply say… thank you. You said it all Judy and so much better than I could. “Bridge Over Troubled Water” – one of my all time favorite songs. A beautifully written post. I’ve been very pleased to learn that my 10 year old grandson’s favorite artist is Paul Simon. His favorite album is Kodachrome. Timeless music. “Bridge Over Troubled Waters” is one of my favorite songs. Neil Diamond, Sir Elton John and now Paul Simon gracefully stepping away from the grind of touring to better enjoy life. Thank you for many wonderful musical moments. “America” was the song that kept me from feeling too homesick when we lived in Australia when I was in high school. It was a tough transition for an only child. But that song in particular soothed my longing. My fav too. We took our daughter and friends to the Reunion tour about 12 years ago. Still the best ever “after all these years”. The scrapbook from my college.vocal group’s USO tour is held together by the lyrics to “Homeward Bound.” The very first photo I took on the trip was of our gang strewn around the passenger lounge of a snowbound airport, wondering when or if we’d ever get off the ground, and a single lonely suitcase and guitar sitting, temporarily ignored, on the floor in the center of the frame. The picture wasn’t posed or planned. The image just presented itself and the song fell into place around it, and continued to resonate with everything else that happened from then on.